Question: I saw where someone had gotten Botox injections in their neck to relieve muscle spasms. Last summer we did this and it was amazing! What was "that" Dan? It looks like some river rafting I think. That water looks really muddy. Glad to see you out doing things you enjoy! 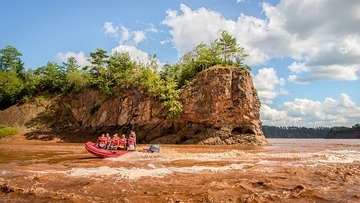 We rode the tidal bore in Nova Scotia. I tried to post the video. I will try again. It was wild. You are in the right place. This site has ben a wonderful fellowship and source of information for me. Thank you for your encouragement. 7 years is a good sign. I am brand new to this. I have very fast growing squamous cell carcinoma of the lymph nodes in my neck, noted on Christmas day 2018, after skin lesion on my ear was removed in Nov. A friend suggested I contact Sloan Kettering, and am scheduled for surgery next Mon. on the 4th. I see you are in CT. My daughter is in Norwalk, and I will stay with her for a bit after the surgery. Thanks for the contact. I am glad I found this site. Mine was found by accident while looking for the source of my neuralgia(they still haven't found it). Had 2 radical neck dissections. More MRI's, CT scans, and PET scans than I can count. Try to believe in yourself, that all of the work that you put in is worth it because with every day that passes, you are winning the battle. Stay positive, it helps. Best of luck to you, Sending you healing light and positive energy. I am always available to answer questions if I can be of any assistance. Question: Should we get the stomach tube four weeks after radiation therapy? Question: Has anyone had what my doctor calls a "throat dilation"? Question: What are you doing/have you done this weekend to "Live Your Life.....Not Your Cancer"?